Well, I would like to see the day where WoW turns F2P (probably around the time their next MMO "Titan" comes out). In my eyes, judging from all the P2P games that went F2P (DC Universe, TF2, etc. ), they made MORE money and had a LARGER playerbase than when they were charging 10$-15$ a month (or in TF2's case, when you had to pay 5-15 dollers upfront to get in, depending if their is a ridiculous Steam sale going on). Yeah i prefer the subscription model too. Mostly because many of the MMO's that do offer subscription extras often have many large updates within a year. Partially because microtransaction-based games wont try to prey on me not registering the cumilative ammount of money ive dropped on the game. There is just a part of me that thinks this helps their smiles get bigger, since their share gets bigger, as well. I am confused as to the point of this article, as it just shows how much of Activision has been leaking into Blizzard, mucking things up. It doesn't make me happy, as nothing will change for the better as far as gamers are concerned. When Diablo 3 is released and Blizzard starts making bucketloads of money from the Auction House there, that money won't go to WoW to rehire those 600 employees, because a fair chunk of that cash will be needed to pay for the servers Blizzard needs to run to keep Diablo 3 online all the time. The rest will just go into the pockets of the top brass. Yes, this comment is not all lollipops and joy. But what joy is there to be found here? Unless you are a Blizzard employee whose job isn't on the chopping block when the next 10,000 subs get dropped? Money moves faster in smaller amounts. The less you have to pay at one time, the more you'll be willing to pay it. seriously his WoWWiki page (nothing on Wowpedia) has nothing on it other than a cite that names him as a senior producer (a cite about "still wanting to bring wow to iphone"...another PR "story which isn't") that's dated 2 days ago. i honestly suspect he's a suit kicked down from high upstairs to shake the WoW tree over and above the heads of the dev team (almost all of whom i would recognise). I'm going to go with a selfish opinion here, but I feel a subscription model keeps at least some of the trolls at bay. It's a lot easier to join free games if you're just in the mood to ruin other people's fun, most people who just want to be dicks don't want to badly enough to actually pay for it. I'm resistant to the "free to play" model because it usually turns into a "pay for everything model" and to remain compeititive you typically wind up having to spend more per month to play than a subscription. The original idea was that by going FTP they game developers actually lower the prices in hopes of making it up or surpassing the subscription fees due to attracting a higher volume of players, but that rarely if ever is the way things turn out. What's more as conceived originally, the FTP system wound up with the devs selling largely cosmetic items to support the game, a sort of reward to show you donated. They moved on to things like exps buffs and the like, which I guess were not that big a deal, but then they got into directly selling power to players, in the form of instituting caps for things like money and resources on free players and demanding payment to remove them, or extremely powerful spaceships (including the whole top level tier of ships) in "Star Trek Online". Basically if you want to play a game like this it's a never ending money pit, and I think these games rely on people being too dumb to figure that out and not realizing how much they spend a little at a time. I personally prefer the $15 subscription fee, which also comes with all players being on equal footing. I see the FTP transitions as being a sign of the industry getting too greedy. Subscription based games were making a decent profit, but instead companies are looking at the FTP model as a way of wringing even more money out of it. Dying games were those that simply reached the end of their lifecycle or were the result of corners being cut in design (ie not enough content, especially at the end game), I don't think going FTP was really a good move in many cases when a company should have moved on to doing something new if there was little interest in people paying for the game and it retaining it's integrity. Also, the whole issue with WoW is simply because nobody wants to invest the money in competing with them. The thing is that new games need to compete with WoW as it is now, and be designed for veteran MMO players since there are few remaining true "noobs" to the genere. For a while people thought ToR was going to be a game developed on a level to compete with WoW but it turned out EA/Bioware really didn't invest that much money into it, nor did they really create much of an experience for veterans MMO players. As a result it might last longer before dying and needing that FTP-resurrection dust than other games, but as most people have pointed out it inevitably on that track. To an extent I see FTP games and transitions as in part being a cop out from developers that refuse to do what is nessicary to create a game capable of maintaining a huge WoW-like subscription base. Can't say I blame them. WoW will probably go the F2P model eventually as numbers decrease, but that's still a ways off. In other news: water is wet, the sky is blue and fire is hot. I just want to put that most of the 600 employees were foreign-language customer service representatives and localization teams, Blizzard didn't see the sense in having both Blizzard and Activision localization teams in the same areas. In Q4 2011 WoW only lost 100,000 subscribers during the height of the Old Republic launch. They must of done something right after the 500,000 Q2 and 600,000 Q3 loss. "Blizzard has a solid gold logo, 'cause they're loaded!" Their subscrition mode lstill makes them one of the most profitable games ever. why change? yes there are many free to play games. but majority of them are still rather small (with couple exceltinos like LOL). and small games (like world of tanks) arent really a threat to WOW, since wow is part of our culture now. maybe in 20 years we will be making movies with cultural references about wow that "new generation wont understand" like we do with 80s music now? who knows. wow surely is the most known mmo out there, enve if not the biggest one anymore. Also did somone just reference Tobuscus? i thought like NOONE knew this guy. I agree that many games went this route which is very bad. And i have to admit i play one of them. however in this game being good matters more than items bought via the game. i am having fun without spending anything on the game (yet) and that is all that matters - having fun. 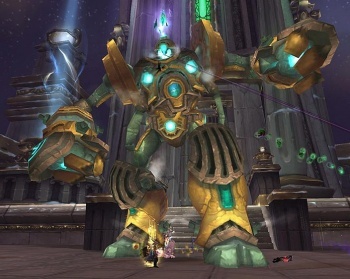 WoW's subscription model has nothing to do with them losing subscribers. For God's sake, you're saying that in the same sentence as "TOR cost them subscribers", where TOR has the exact same friggin' model. It's old age mostly and a bit of "incoming big MMOs". TOR was one, though GW2 is likely to deal a much bigger strike and a much more permanent one. There's also other kinds of MMOs coming like Firefall and such, so for the first time in a long while, WoW has some real competition coming.